Nobody’s perfect—or so the saying goes. But can you have a perfect smile? The answer to that question may indeed be “Yes!” If you look at your smile in the mirror, in a photograph or in an online selfie—where more and more smiling faces are appearing than anywhere else!—and see a slight imperfection that annoys you, then your cosmetic dentist in Aurora can help. Dr. Mauck and Dr. Ricci are experts in the dental art of cosmetic bonding. With this fast and easy treatment, they can repair the slightest imperfection, so you smile looks absolutely perfect to others and in your eyes, too. Cosmetic bonding may be a simple procedure, but it can make a big difference in the look of your smile. As a sculptor would use clay to create a masterpiece, our dentists can use cosmetic bonding to sculpt more beautiful teeth when cracks, chips, stains, or gaps have taken a toll. The material that is used to reshape your tooth with cosmetic bonding is the same material we use to fill a cavity with a tooth-colored filling. Using composite resin, Dr. Mauck and Dr. Ricci can fill in spaces, reshape your teeth, or cover up stains without having to modify your natural teeth. And if the composite resin is strong enough for a filling, which is usually in a spot that must withstand the pressure of biting and chewing, then this same material is certainly appropriate for the dental bonding Aurora residents want to rejuvenate their smiles. Cosmetic bonding is a more conservative option for those whose cosmetic issues don’t warrant porcelain veneers, which require permanently altering a tooth by removing a small amount of enamel. Cosmetic bonding, on the other hand, does not require any tooth preparation and can usually be completed without any anesthesia. During this procedure, one of our dentists takes a small dab of composite resin and bonds it to you tooth. Then the material is molded, quickly dried with a curing light and filed into shape. This process can be repeated several times until the optimal shape for your tooth is achieved. If all your smile needs is a little pick-me-up, cosmetic bonding could be the answer. So, if you’ve been thinking about correcting that little imperfection in your smile, then go ahead and do it! Why settle for less when cosmetic bonding can easily and affordably give you the smile you want? 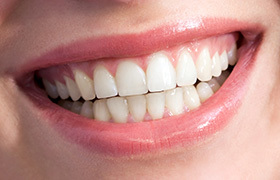 We can also use cosmetic bonding as a component of your complete smile makeover. Offering this procedure along with porcelain veneers, porcelain crowns, inlays, onlays, and teeth whitening for life, D'Amico and Mauck, DDS truly is a comprehensive cosmetic dentistry practice for the Denver area.